"We're launching a brand-spanking new SKU (that is, a new line or sub-brand of products within an existing master brand). I want you to create an ad that highlights what's innovative and new about this new line (it's the "news" that sells, I tell ya!) BUT I want you to stay true to the already established big idea of the master brand and keep it within that existing creative wrapping." And so the dance begins... how do you launch a new SKU with stopping power while staying within the existing (re: familiar) creative wrapping of an already established (re: familiar) brand idea that is meant to represent the master brand (re: familiar!!!)? The answer is easy: you can't. Other than linking the launch to the master brand through cursory means (ie. using the same tagline at the end, using the same mnemonic, using a few visual brand cues/mandatories), in order for a new SKU to truly have an impact on consumers (and thus, move product ) it should focus on what makes the new SKU so new and exciting (once again, it's the "news" that sells, I tell ya!). The aim of a new SKU is disruption - that is, disrupting a consumers routine, or the way they normally look at a brand or category, by shaking things up. Now, normally I would dip into by favourite brand example for this one: McDonald's. Whenever they are launching a new SKU (ie. coffee, the mediterranean burger, etc. ), they always do a good job at going with ads that have stopping power (giant cups of coffee, anyone?). But, as a change of pace, why not dip into the mecca of packaged goods advertising? I'm talking about magazines, specifically: Chatelaine. The brief here was simple. We're launching a new line of whole wheat KD Cups (Kraft Dinner served in easy to cook, microwaveable cups), and we need to call out the whole wheat news in an interesting and compelling way. 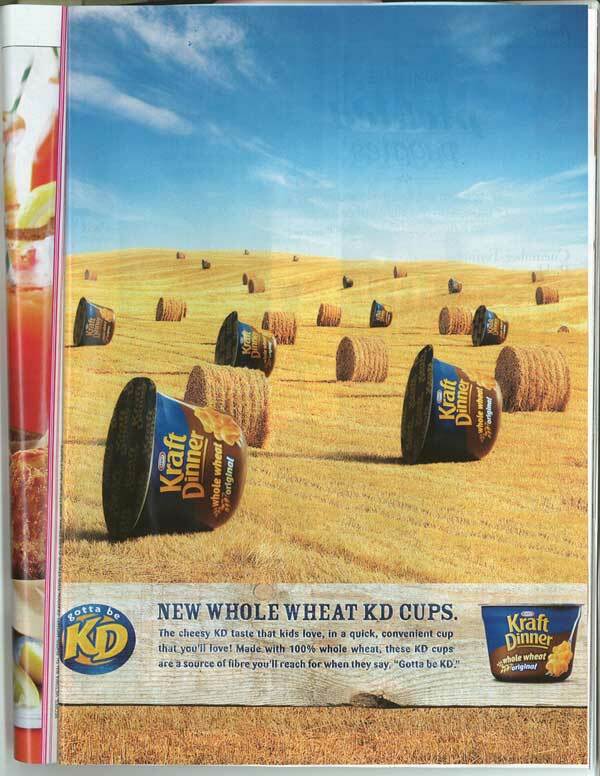 If the brief was simple, the creative idea was even simpler - why not play off of the fact that KD Cups sort of look like those bundles of wheat you always see lying around farm fields during the drive up north? The tongue-in-cheek play-on-visuals looks like a cheeky optically illusion, and definitely stopped me from flipping the page. But perhaps most importantly, it screams: whole wheat. This was an interesting one. 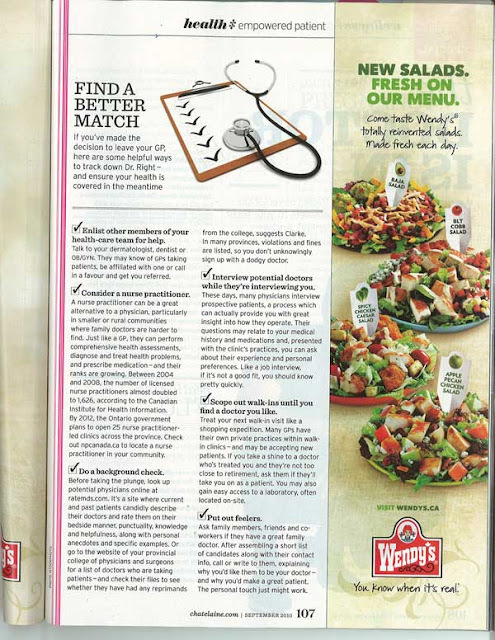 The Wendy's "You know when it's real" campaign and brand promise has been in market for a while, and Wendy's has been building a strong association with "fresh, never frozen" burgers for years. But when it comes to Fresh Salads, Wendy's is probably one of the last places you'd think to look. McDonald's has usually done the better job at promoting the idea of fast food salads. But this ad, especially the full-page, does the trick. 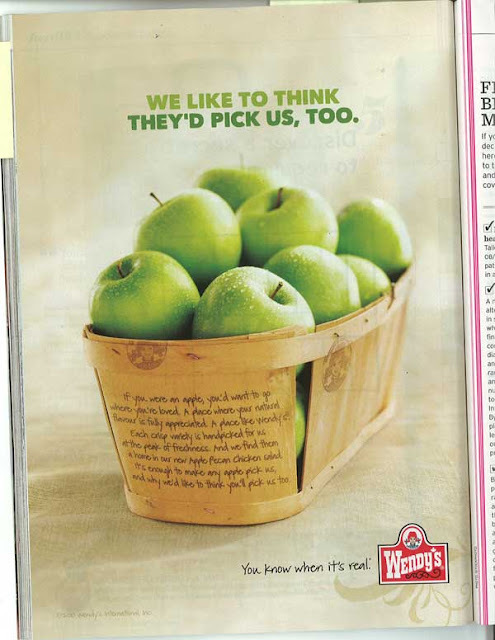 There is just something startling about seeing a basket of plump, juicy, freshly-picked apples and the Wendy's logo on the same page, so much so that it made me want to read what this ad was all about. Now that's stopping power! Another simple brief (though now that I think of it, which new SKU brief isn't, in the end, exceedingly simple?). We need to communicate the news that blueberries have finally arrived in the world of Special K. What is that world of Special K, exactly? It's a world of exercise, yoga, and women in leotards, to be blunt. So what better way of shaking things up than giving the Special K woman a giant blueberry to work with instead of an exercise ball? Well, this ad is what you'd get. Not the best creative, for sure. 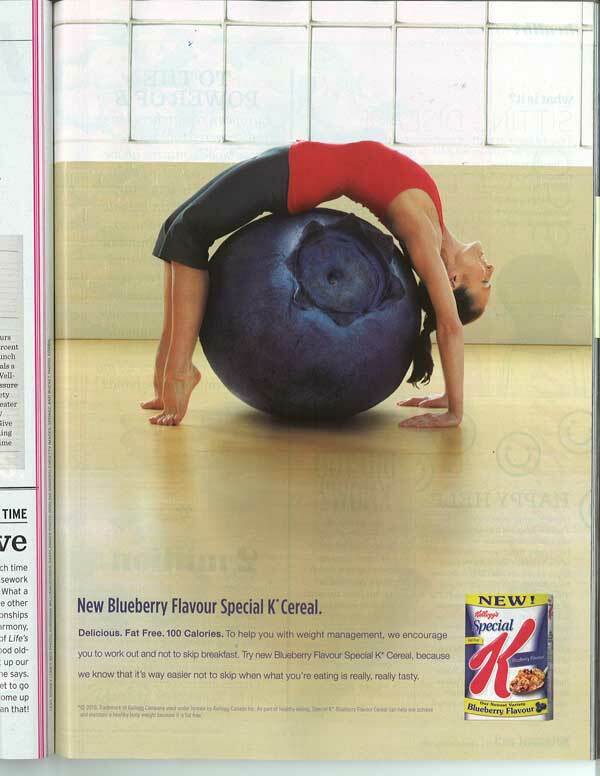 But the visual trick (similar to what KD Cups did with the bales of wheat) was enough to stop me in mid-turn and make me connect the dots - Special K is launching a new cereal. Job well done. And there you have it. Three interesting ads out of Chatelaine that do nothing more than they were asked to do. They each did enough creatively to both stop you in your tracks by compelling you to take a closer look, and immediately communicating what is new and exciting about the new SKU. So the next time your client asks you to dance the fine line between an existing brand idea and the features of a new SKU, you know what to tell them: "It's the "news" that sells, I tell ya!!"